Are the Modifications Difficult to Make ? The sites linked to on the previous page, and the instruction for modifying webcams on this site, are all presented in a positive manner to encourage you to make the modifications to a camera. In the Autumn of last year when these mods were first described there was much doubt if the work was realistically doable by hobbyist electricians. Many messages were posted to the internet discussion groups on the folly of attempting the work. The good news is that many webcams have now been modified and the discussion groups have many good images taken with the camera. More worryingly I am receiving increasing numbers of e-mails from people whose cameras did not survive the procedure. On this page I will try to dissuade you from doing the work. If you get to the bottom and are still confident of your abilities then go for it! Its all a matter of proportion. 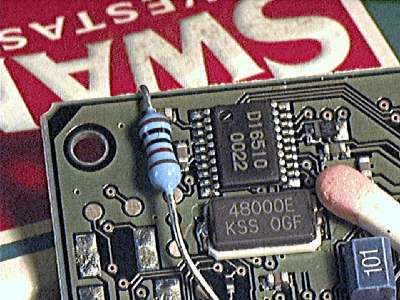 Many extreme close-up pictures have been made of the 16510 which can make it look quite a simple chip to work on. I have heard from a number of people, who have bought cameras especially to do the mod, whose plans were scuppered when that saw the size of the chip. Its not just a case of it being a bit small to see. You will also need tools to do the job. 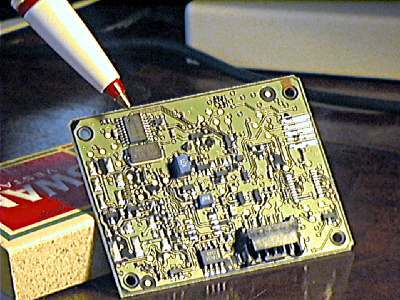 This is a picture of a standard soldering iron near the chip. Trying to use it would be completely futile. Finally a picture of the chip with a couple of recognisable objects in the frame. The concept I am trying to get across here is that the chip is very small! 6mm long to be precise with 10 legs per side. The legs are about a quarter of a mm thick. How large is the tip of your soldering iron? Another point to consider is your PC. To make the mod you will need to attach wires direct to the USB bus and to the printer port. Both are commonly connected direct to the motherboard of a PC. By making a wrong connection it is very easy to envisage a situation were damage is not limited to the camera! These modifications are attempted by 3 groups of people. People who do this kind of work for a living and who have access to temperature control, surface mount, soldering stations. This group generally recognise that success can not be completely guaranteed. However they are better placed than me to judge the difficulty. People for whom electronics is an enjoyable hobby. Will have made many circuits before and have lots of circuit boards etc hanging from their PC's. For this group doing the mod will be fun. It could be used to justify the purchase of a decent soldering station in the knowledge that it will always come in handy later. True the mod may not work but what is success without the risk of failure? 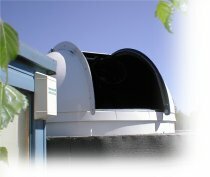 People who have seen the fabulous images these cameras are capable of producing and are looking for a cheap way into deep sky imaging. 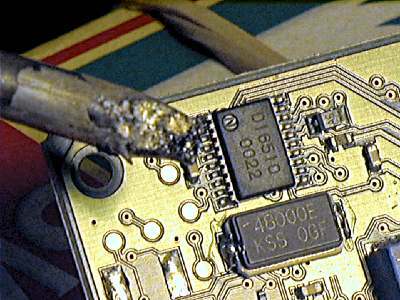 This group have not done any soldering for a few months or maybe years. The webcam may have been bought at full price just to be converted. Generally the cost of tools spare webcam's etc haven't been considered. If you think you fall into the last group consider how you are going to feel if you spend a frustrating week fighting with the soldering iron only to end up with a knackered camera. Doing these modifications in order to save money only makes sense if you already have the tools and experience. Have a realistic think about it!